When I wrote about The Path (blog 935) and incorporated the text into my essays THE TRUTH 3 & 4, I read a critique of The Path which said it was practically congruent with any text in Western religions, outlining the values of virtue and proper conduct of living. This spurred me on to have a closer look at the source of the Christian value system … on researching the subject it came down to Jesus Christ’s The Sermon On The Mount, as written down in Matthew's gospel, in approx. 80 AD ... so that is about 50 years after Christ delivered the sermon. The Sermon On The Mount is by far Jesus' longest explanation of what it looks like to live as His follower and to serve as a member of God's Kingdom. 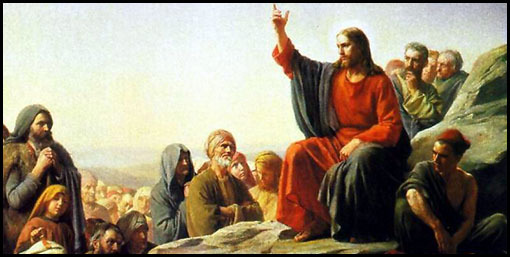 In many ways, Jesus' teachings during the Sermon on the Mount represent the major ideals of the Christian life. For example, Jesus taught about subjects such as prayer, justice, care for the needy, handling the religious law, divorce, fasting, judging other people, salvation, and much more. The Sermon on the Mount also contains both the Beatitudes (Matthew 5:3-12) and the Lord's Prayer (Matthew 6:9-13). In the end, Jesus made it clear that His followers should live in a noticeably different way than other people because His followers should hold to a much higher standard of conduct - the standard of love and selflessness that Jesus Himself would embody when He died on the cross for our sins. It's interesting that many of Jesus' teachings are commands for His followers to do better than what society allows or expects. Interesting for me is the concept of Christianity’s “Father up in Heaven” which is very much in contrast to the teachings of the inner God, which is supported by Meister Eckhart … see my essay GOD 2 as well as GOD 1. So, myself, I cannot reconcile any belief I have with the Christian tenets as taught by Jesus Christ, other than the universal ideals of love, humility, compassion and forgiveness. ... George Bernard Shaw once described the Sermon on the Mount as “an impractical outburst of anarchism and sentimentality.” The German philosopher Friederich Nietzsche treated it even less kindly when he wrote that “Christian morality is the most malignant form of all falsehood”. In 1929 humanist John Herman Randall was willing to acknowledge that Jesus was ”a truly great moral genius” but then wondered how a Galilean carpenter could have uttered the final word on human ethics. But many more people have held this sermon in great reverence even when they did not know or understand it very well. It is safe to say that the Sermon on the Mount is the best known, least understood, and least practiced of all the teachings of Jesus. The modern mind, religious as well as irreligious has treated this sermon in a variety of ways. As earlier noted, some have rejected it as wholly impractical or positively evil. Others have received it, but with significant reservations. Humanism, at its kindest, has viewed it as a remarkable but tentative moral code wholly separated from the cross or a divine Christ. These are some of the possible takes on The Sermon On The Mount and below them is a complete translation from the original Aramaic text. In recent centuries, it has been more common to change the words in the Sermon, to take out parts that people would have trouble accepting. Almost every major Christian writer has made changes like this at some point. The interim ethic view says that when Jesus gave the Sermon, he thought the world was going to end very soon. Because of this, his teachings were only meant for that short time. THE SERMON ON THE MOUNT , MATT, v.-vii. Translation by J. Alexander Findlay, M.A. 1 And seeing the multitudes, he went up into the mountain : and when he had sat down, his disciples came unto him : 2 And he opened his mouth and taught them, saying, 3 Blessed are the poor in spirit : for theirs is the kingdom of heaven. 4 Blessed are they that mourn : for they shall be comforted. 5 Blessed are the meek : for they shall inherit the earth. 6 Blessed are they that hunger and thirst after righteousness : for they shall be filled. 7 Blessed are the merciful : for they shall obtain mercy. 8 Blessed are the pure in heart : for they shall see God. 9 Blessed are the peacemakers : for they shall be called sons of God. 10 Blessed are they that have been persecuted for righteousness' sake : for theirs is the kingdom of heaven. 11 Blessed are ye when men shall reproach you, and persecute you, and say all manner of evil against you falsely, for my sake. 12 Rejoice, and be exceeding glad : for great is your reward in heaven : for so persecuted they the prophets which were before you. 13 Ye are the salt of the earth : but if the salt have lost its savour, wherewith shall it be salted ? It is thenceforth good for nothing, but to be cast out and trodden under foot of men. 14 Ye are the light of the world. A city set on a hill cannot be hid. 15 Neither do men light a lamp, and put it under the bushel, but on the stand ; and it shineth unto all that are in the house. 16 Even so let your light shine before men, that they may see your good works, and glorify your Father which is in heaven. 17 Think not that I came to destroy the law or the prophets I came not to destroy, but to fulfil. When He saw how dense the crowd was growing, He went up into the hills ; there He sat down, and, when His disciples had come up to Him, He opened His heart to them, saying in the course of His teaching: I have good news for the humble to them belongs the new age that God is bringing in ; for mourners there is good cheer in store for them ; for the patient and forbearing theirs by native right is the lordship of the life of man ; for those who are hungry and thirsty for the ideal life they shall receive full satisfaction ; for the brotherly they shall receive brotherly treatment ; for the single-minded they shall look upon God's face; for peacemakers they shall be called men of God's own pattern ; to those who have ever suffered hardship in the cause of right God's new world is their possession. That is why you should never fear persecution ; indeed, when you have to put up with reproach, ill-treatment, every kind of slander, all because you will be My disciples, you should welcome your troubles with exulting joy ; you will be real prophets then, and, like those who went before, God will reward you in His own great way. You are the salt of society : that is what you were meant for, to keep the world wholesome. No one has any use for insipid salt ; people pitch the stuff into the street, and there's an end of it. You are the world's sunlight ; like yonder town on the hilltop, you cannot hide if you try. Even with the lamp at home, you do not light it, and then put it under a basin, but on the lampstand, so that every one in the room can see by its light. Take care, then, that your light shines out in all men's sight, that they may not fail to notice the tightness of the things you do, and may come to thank God that they ever met you. Do not suppose that I have come to destroy the old religion ; my mission is not to supersede the (current religion). 18 For verily I say unto you, Till heaven and earth pass one jot or one tittle shall in no wise pass away from the law, till all things be accomplished. 19 Whosoever therefore shall break one of these least commandments, and shall teach men so, shall be called least in the kingdom of heaven : but whosoever shall do and teach them, he shall be called great in the kingdom of heaven. 20 For I say unto you, that except your righteousness shall exceed the righteousness of the scribes and Pharisees, ye shall in no (wise) way enter into the kingdom of heaven. 21 Ye have heard that it was said to them of old time, thou shalt not kill ; and whosoever shall kill shall be in danger of the judgement : 22 But I say unto you, that every one who is angry with his brother shall be in danger of the judgement; and whosoever shall say to his brother, Raca, shall be in danger of the council ; and whosoever shall say, Thou fool, shall be in danger of the hell of fire. 23 If therefore thou art offering thy gift at the altar, and there rememberest that thy brother hath aught against thee, 24 Leave there thy gift before the altar, and go thy way, first be reconciled to thy brother, and then come and offer thy gift. 25 Agree with thine adversary quickly, whiles thou art with him in the way ; lest haply the adversary deliver thee to the judge, and the judge deliver thee to the officer, and thou be cast into prison. 26 Verily I say unto thee, thou shalt by no means come out thence, till thou have paid the last farthing. 27 Ye have heard that it was said, thou shalt not commit adultery : 28 But I say unto you, that every one that looketh on a woman to lust after her hath committed adultery with her already in his heart. 29 And if thy right eye causeth thee to stumble, pluck it out, and cast it from thee : for it is profitable for thee that one of ancient sanctions, rather to unfold their deeper meaning. Mark this ! the universe itself shall pass away, before the smallest detail of God's law revealed in Scripture comes to be out of date ; rather shall every part disclose a larger truth. It follows that the man whose teaching lessens the force of what seem to be the least important of God's laws, has but a very humble place in the age which I proclaim ; on the other hand he whose practice and teaching enhance their authority shall have wide influence there. All the same, your practice of the moral law must go far beyond the code of conduct preached by professional moralists ; only a new way of life can qualify you for the new world that is coming. I will illustrate my meaning ; you know the old words of Scripture, 'You are not to commit murder,' your teachers go on to say, ' Whoever kills must come up for trial.' What I tell you is that every one who persists in unreasonable anger with a brother-man, must account for his behaviour ; whoever treats another with contempt shall be indicted for blasphemy ; whoever curses another brings down upon himself the doom he has invoked. And more than this, until you are on good terms with your brother, you must not bring your gifts to God's altar ; if, when you have brought your gift you remember that he has anything against you, you must leave the gift where it is, go and make friends with your brother, and then offer your gift. Never lose a chance of making friends ; if you are involved in a law-suit, you must try to come to an understanding with your opponent on the way to court. Remember, God is judge ; if you prolong the quarrel, it will be you that He will condemn, whatever happens to the other man; the man who nurses ill-will always pays, and to the last penny too. Again the word of Scripture runs, ' You must not commit adultery.' What I have to say on this subject is : Every one who casts upon a woman a lustful look has already in his heart seduced her. If some passion of this kind is your hindrance, you must tear yourself away from it at all costs ; better to live a maimed life, than with all your bodily powers about you be plunged into a hell of unsatisfied desire. If your daily business thy members should perish, and not thy whole body be cast into hell. CHAPTER V. 30 And if thy right hand causeth thee to stumble, cut if off, and cast it from thee : for it is profitable for thee that one of thy members should perish, and not thy whole body go into hell. 31 It was said also, Whosoever shall put away his wife, let him give her a writing of divorcement : 32 But I say unto you, that every one that putteth away his wife, saving for the cause of fornication, maketh her an adulteress : and whosoever shall marry her when she is put away committeth adultery. 33 Again, ye have heard that it was said to them of old time, Thou shalt not forswear thyself, but shalt perform unto the Lord thine oaths : 34 But I say unto you, swear not at all ; neither by the heaven, for it is the throne of God ; 35 Nor by the earth, for it is the footstool of his feet ; nor by Jerusalem, for it is the city of the great King. 36 Neither shalt thou swear by thy head, for thou canst not make one hair white or black. 37 But let your speech be, Yea, yea ; Nay, nay : and whatsoever is more than these is of the evil one. 38 Ye have heard that it was said, An eye for an eye, and a tooth for a tooth : 39 But I say unto you, Resist not him that is evil : but whosoever smiteth thee on thy right cheek, turn to him the other also. 40 And if any man would go to law with thee, and take away thy coat, let him have thy cloak also. 41 And whosoever shall compel thee to go one mile, go with him twain. 42 Give to him that asketh thee, and from him that would borrow of thee turn thou not away. 43 Ye have heard that it was said, Thou shalt love thy neighbour, and hate thine enemy : 44 But I say unto you, Love your enemies, and pray for them that persecute you ; puts a hindrance in your way, be rid of it, whatever it costs ; better to be a broken man, than in the full tide of your well-being to find yourself in hell. The old law ran : ' Whoever would be rid of his wife must make proper provision for her ! ' I go a stage further and say leaving on one side the question of misconduct you are not to part company with your wives at all ; if you do, you are to blame if they go wrong, while the man who marries a woman already divorced commits adultery himself. Another illustration: you have all heard the law once given to your fathers ' You must not commit perjury, but must fulfil your vows as in God's sight.' I tell you, you should not need to swear by this and that at all. Heaven is God's throne, Earth His footstool, Jerusalem the city of the King of Kings ; your head for the matter of that is sacred too you know you cannot make a single hair really white or black. Great words like these are God's gift to you, and are not to be used as makeweights to your light talk. ' Yes, yes ' ; ' No, no ' ; that is emphasis enough for you ; when you go beyond such simple speech, you are giving the devil his chance. Once more ; you know the words, ' Eye for eye, tooth for tooth ' ; your teachers explain them as meaning ' slap for slap, or give as good as you get.' I tell you, to follow this line of action is to measure yourself with the devil. Whoever slaps you on the right cheek* let him do it again, if he wants to ; if some one takes you into the law-courts, and to pay the damages you have to forfeit your vest, make him a present of your upper garment as well ; if you are pressed to go one mile in the government service, of your own accord accompany the officials who commandeer your services the rest of the league. You are to be at the service of every claimant, and are not to turn churlishly away from any one that wants to borrow of you. Again, you have heard the words of Scripture, ' Love your fellow-countrymen,' and know the conclusion your teachers draw . *That is, ' whoever insults you ' ; a blow on the left cheek is a figure used for real injury, a slap on the right cheek for insult is the idiom current in those days. CHAPTER V. 45 That ye may be sons of your Father which is in heaven : for he maketh his sun to rise on the evil and the good, and sendeth rain on the just and the unjust. 46 For if ye love them that love you, what reward have ye ? Do not even the publicans the same ? 47 And if ye salute your brethren only, what do ye more than others ? Do not even the Gentiles the same ? 48 Ye therefore shall be perfect, as your heavenly Father is perfect. 1 Take heed that ye do not your righteousness before men, to be seen of them : else ye have no reward with your Father which is in heaven. 2 When therefore thou doest alms, sound not a trumpet before thee, as the hypocrites do in the synagogues and in the streets, that they may have glory of men. Verily I say unto you, they have received their reward. 3 But when thou doest alms, let not thy left hand know what thy right hand doeth : 4 That thine alms may be in secret : and thy Father which seeth in secret shall recompense thee. 5 And when ye pray, ye shall not be as the hypocrites : for they love to stand and pray in the synagogues and in the corners of the streets, that they may be seen of men. Verily I say unto you, They have received their reward. 6 But thou, when thou prayest, enter into thine inner chamber, and having shut thy door, pray to thy Father which is in secret, and thy Father which seeth in secret shall recompense thee. ‘You are to hate all foreigners.' I tell you, you must love those whom you have learnt to think of as your enemies, and, if they oppress you, must pray for them. So shall you really be like God your Father ; you know He makes His sun to shine down on bad and good alike, and sends His rain upon all men, whether they obey or disobey His will. Supposing that you love only those that love you back, there is no special merit in that, is there ? Quite disreputable people rival you there ! Or if you are friends only with the people of your own set, that implies nothing more than average good nature ; the very heathen are equal to that ! No, you are to be God's men ; your love is to be as catholic as His. Be careful not to follow the way of life now laid down for you with an eye to human appreciation ; if you do so, you take all the virtue out of it from God's point of view. When you are practising your charities, you are not to obtrude them upon public notice as self-advertising philanthropists do in church or street, to win the applause of men. Of course they get what they want, and there is an end of the matter. But when you are doing a brotherly action, your left hand is not to know what your right hand is about ; you are not to feel virtuous. Nor need you concern yourselves about reward, for there are no secrets to which God our Father is not a party, and He will make it up to you. When you pray, you are not to go about it like the people who air their piety ; you know how fond they are of engaging in prayer for the edification of onlookers. They get what they want admiration ; but God has nothing to do with this kind of thing. When any one of you is drawn to pray, he will do well to go apart and retire into himself, there holding converse with God, who dwells in secret places ; his Father, from whom no secrets are hid. will Himself reward him. CHAPTER VII. 7 And in praying use not vain repetitions, as the Gentiles do : for they think that they shall be heard for their much speaking. 8 Be not therefore like unto them : for your Father knoweth what things ye have need of, before ye ask Him. After this manner therefore pray ye : Our Father which art in Heaven, Hallowed be thy name. 10 Thy kingdom come. Thy will be done, as in Heaven, so on Earth. 11 Give us this day our daily bread. 12 And forgive us our debts, as we also have forgiven our debtors. 13 And bring us not into temptation, but deliver us from the evil one. 14 For if ye forgive men their trespasses, your heavenly Father will also forgive you. 15 But if ye forgive not men their trespasses, neither will your Father forgive your trespasses. 16 Moreover when ye fast, be not, as the hypocrites, of a sad countenance : for they disfigure their faces, that they may be seen of men to fast. Verily I say unto you, they have received their reward. 17 But thou, when thou fastest, anoint thy head, and wash thy face ; 18 That thou be not seen of men to fast, but of thy Father which is in secret : and thy Father, which seeth in secret, shall recompense thee. 19 Lay not up for yourselves treasures upon the earth, where moth and rust doth consume, and where thieves break through and steal : 20 But lay up for yourselves treasures in heaven, where neither moth nor rust doth consume, and where thieves do not break through nor steal : 21 For where thy treasure is, there will thy heart be also. 22 The lamp of the body is the eye : if therefore thine eye be single, thy whole body shall be full of light. 23 But if thine eye be evil, thy whole body shall be full of darkness. If therefore the light that is in thee be darkness, how great is the darkness ! *0r perhaps ' our needful food ' : I cannot decide between these two renderings. CHAPTER VII. 24 No man can serve two masters : for either he will hate the one, and love the other ; or else he will hold to one, and despise the other. Ye cannot serve God and mammon. 25 Therefore I say unto you, Be not anxious for your life, what ye shall eat, or what ye shall drink ; nor yet for your body, what ye shall put on. Is not the life more than the food, and the body than the raiment ? 26 Behold the birds of the heaven, that they sow not, neither do they reap, nor gather into barns ; and your heavenly Father feedeth them. Are not ye of much more value than they ? 27 And which of you by being anxious can add one cubit unto his stature ? 28 And why are ye anxious concerning raiment ? Consider the lilies of the field, how they grow ; they toil not, neither do they spin : 29 Yet I say unto you, that even Solomon in all his glory was not arrayed like one of these. 30 But if God doth so clothe the grass of the field, which today is, and to-morrow is cast into the oven, shall He not much more clothe you, O ye of little faith ? 31 Be not therefore anxious, saying, What shall we eat ? or What shall we drink ? or, Wherewithal shall we be clothed ? 32 For after all these things do the Gentiles seek ; for your heavenly Father knoweth that ye have need of all these things. 33 But seek ye first his kingdom, and his righteousness ; and all these things shall be added unto you. 34 Be not therefore anxious for the morrow : for the morrow will be anxious for itself. Sufficient unto the day is the evil thereof. CHAPTER Vn. 1 Judge not, that ye be not judged. 2 For with what judgement ye judge, ye shall be judged: and with what measure ye mete, it shall be measured unto you. 3 And why beholdest thou the mote that is in thy brother's eye, but considerest not the beam that is in thine own eye ? You must make your choice between devotion to God and absorption in this world's business, for no one can really bind himself to the service of more than one master at a time ; he will either dislike the one and love the other, or he will become attached to the one and disparage the other. So I bid you not to worry about yourselves, so far as food and clothes are concerned. You are far more important than the food you eat ; your bodies are more beautiful than the clothes you wear. Study the wild birds ; they do not sow or reap or lay up a store for the winter, yet God your Father looks after them,- and you are more precious in His sight than they ! Worry never makes you any better-looking, does it ? What is the use of worrying about clothes ? Learn a lesson from the wild flowers they have no toilsome dressmaking to do, yet I tell you Solomon in full dress was not so well clothed as they ! If God dresses the very grass so well, the grass which grows in the meadow to-day, and tomorrow is dry and dead, surely He will take more pains with you, you poor, mistrustful people ! You must not let yourselves worry, or say, ' How are we going to make ends meet ? ' or, ' What about the clothes I want so badly ? ' The thoughts of worldly people revolve round subjects like these ; surely God your Father knows how many your needs are ! The bringing to birth of God's new world, the practice of His way of life, must be your first concern ; all other needful things will come your way, if this be so. Live a day at a time, and let to-morrow look after itself. Every day brings its own burden of care, and one day's trouble at a time is as much as you can. Do not indulge your critical faculties too much you lay yourself open to criticism if you do ; in the long run you will be done by as you did. Why do you take so much notice of the splinter in your brother-man's eye. CHAPTER VII. 4 Or how wilt thou say to thy brother, Let me cast out the mote out of thine eye ; and lo, the beam is in thine own eye ? 5 Thou hypocrite, cast out first the beam out of thine own eye ; and then shalt thou see clearly to cast out the mote out of thy brother's eye. 6 Give not that which is holy unto the dogs, neither cast your pearls before the swine, lest haply they trample them under their feet, and turn and rend you. 7 Ask, and it shall be given you : seek, and ye shall find ; knock, and it shall bs opened unto you : 8 For every one that asketh receiveth ; and he that seeketh findeth : and to him that knocketh it shall be opened. 9 Or what man is there of you, who, if his son shall ask him for a loaf, will give him a stone ; 10 Or if he shall ask for a fish, will give him a serpent 11 If ye then, being evil, know how to give good gifts unto your children, how much more shall your Father which is in heaven give good things to them that ask him ? 12 All things therefore whatsoever ye would that men should do unto you, even so do ye also unto them : for this is the law and the prophets. 13 Enter ye in by the narrow gate : for wide is the gate, and broad is the way, that leadeth to destruction, and many be they that enter in thereby. 14 For narrow is the gate, and straitened the way, that leadeth unto life, and few be they that find it. 15 If Beware of false prophets, which come to you in sheep's clothing, but inwardly are ravening wolves. 16 By their fruits ye shall know them. Do men gather grapes of thorns, or figs of thistles ? 17 Even so every good tree bringeth forth good fruit ; bat the corrupt tree bringeth forth evil fruit. 18 A good tree cannot bring forth evil fruit, neither can a corrupt tree bring forth good fruit. 19 Every tree that bringeth not forth good fruit is hewn down and cast into the fire. 20 Therefore by their fruits ye shall know them. 21 Not every one that saith unto me, Lord, Lord, shall enter into the kingdom of heaven ; but he that doeth the will of my Father which is in heaven. 22 Many will say to me in that day, Lord, Lord, did we not do without stopping to reflect that there is a whole log in your own ? Why do you busy yourselves with other men's small faults so much, and forget your own big ones ? Self-deluded man, first get rid of the log in your own eye, then you can see straight to pick the splinter out of your brother's eye ! Your fellowship with Me and one another is your signet-ring, your circlet of pearls ; you are not to. expose this sacred bond to the tender mercies of cynical outsiders or mere scandal- mongers ; if you do, they trample your treasure in the dirt, then turn upon you and take away your character too. Ask, and you shall have ; seek, and you shall find ; knock, and the door will fly open. Every one who persists in asking gets something ; the seeker makes discoveries ; to the man who keeps on knocking God's door does open. There is not a man among you who would give his boy a stone when asked for a loaf, or a snake as a substitute for a fish, is there? If, then, sinful men like you know what is best to give your children, surely you can trust your heavenly Father to give good things to those who ask Him ! My rule of life is this : you are to treat every one else as you would like people to treat you ; this is the essence of God's revealed law of con- duct. The door I have now opened to you is narrow, but you must enter it ; the road that leads to a wasted life is broad and smooth, and there is always company enough that way ; the gate is narrow and the road toilsome which leads to life in God's new world, and few discover where it lies. Do not be misled by men who beckon you another way they call themselves ' prophets/ and come to you, looking as harmless as sheep really they are greedy wolves ; you can tell what they really are by the mischief they cause. You do not gather grapes on the thorn-bush, or figs on the thistle, do you ? A healthy tree bears sound fruit, a decayed tree rotten fruit. It is not in nature for a sound tree to bear bad fruit, or for a rotten tree to produce fruit that is good to eat. Every tree that does not bear good fruit is fated to be cut down and burnt. This, then, is the test you are to apply you can measure their sincerity or otherwise by the kind of results they achieve. It is not a question of words merely, for not every one is prophesy by thy name, and by thy name cast out devils, and by thy name do many mighty works ? CHAPTER VII. 23 And then will I profess unto them, I never knew you depart from me, ye that work iniquity. 24 Every one therefore which heareth these words of mine, and doeth them, shall be likened unto a wise man, which built his house upon the rock : 25 And the rain descended, and' the floods came, and the winds blew, and beat upon that house ; and it fell not : for it was founded upon the rock. 26 And every one that heareth these words of mine, and doeth them not, shall be likened unto a foolish man, which built his house upon the sand 27 And the rain descended, and the floods came, and the winds blew, and smote upon that house ; and it fell : and great was the fall thereof. Who calls Me ' Lord, Lord ' shall have a place in God's new world, but only those who carry out My Father God's will. In the day of My coming many shall say, ' Lord, Lord, have we not preached, saved men from the sway of dark powers of evil, healed them body and soul, and all in Thy name ? ' And after all I shall have to tell them publicly, ' You were never Mine ; depart from Me, you are rebels all of you.' All depends, you see, upon the reality of men's relations with Me. The man who listens to My words and carries them into action is like a sensible builder, who builds his house upon the solid rock. The rainy season comes, rivers rise, fierce gusts of wind come sweeping down upon the house, and yet it does not fall ; its foundation lies secure upon the rock. As for the man, whoever he be, who listens to My words and does not carry them into practice, he is like a heedless builder, who builds his house on loose sandy soil. The rainy season comes, rivers rise, fierce gusts of wind batter the house it totters then down it comes in utter ruin !